So, I’ve just freshly jumped off the plane from Malaga back to cold old blightly. I took some interesting books on holiday with me but some were far better than others. The first book I delved into was one I bought at the airport ‘Focus – The Power of Targeted Thinking‘ – I was really excited, grabbed a glass of Tinto de Verano and within 5 minutes was already bored of reading it. Nothing about it was grabbing, you’d spend more time over evaluating yourself on paper with the use of the diagrams and flow charts than actually just getting on with your work. A classic example was “Name five times you have been productive, now evaluate what was different about these projects and times when you haven’t been productive”. I’d be there all day! In web design, you are constantly having to battle with a barrage of distractions, clients on the phone, clients on email, clients on your mobile (god forbid! ), and…our incessant need for coffee/starbucks/food/twitter. So, I got to page 57 or something ridiculously low and put the book down (I finished it after I read the 4 Hour Work Week, it didn’t get any better!) 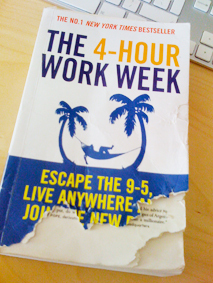 and picked up a book that I nearly didn’t take away with me, that I’ve had for ages “The Four Hour Work Week”. Tim got straight to the point and summed up nearly the whole book of “Focus” with – “say to yourself, if this task is the only task I get done today – will I be satisfied”, and “busyness is a form of laziness”. What a totally different kettle of fish Tim was, I couldn’t put it down and found it a really inspiring way to deal with some of the above problems and distractions we all face on a day to day basis. Some of the most poignant chapters were the section about outsourcing, which could work extremely well if you found someone reliable and did want to travel the world for a while. The chapter on “Interrupting Interruption” said you should only check your emails twice per day (Midday and 4pm), the same with your phone to allow you to batch tasks together, be more productive and get your work done without interruption. I have already spoken with Leanda on Twitter who is saying it’s made a massive difference to her productivity. As far as only working 4 hours per week, I looked into some of the sources available in the book and Tim Ferris has done extremely well from a body supplement called “brainQUICKEN”. I don’t know whether it was already a product and he has aquired the licence for it or as I think, it was made from scratch. Either way, it’s a unique product. Finding a unique product nowadays is becoming increasingly harder, especially on the likes of ebay where price is a residing factor. Dropshipping sources are also becoming less reliable with many new websites springing up charging people for “reputable” dropshipping companies that sell nothing more than “toot” you’d get at a local foreign market (not knocking those though, I got a great Olive dish in Caleta once!). To sum up, this is a really great book to read if you feel like you need a kick up the bottom to be productive, the words “be productive, not active” have stuck with me, and how true they are, I feel like I have a fresh appraoch to my work that I didn’t previously. As Tim says, just because the world has decided that 8 hours per day is what is to be set in stone the world over as “work time” – doesn’t mean you have to adhere to it. Previous Post Working Remotely – Good or Bad?